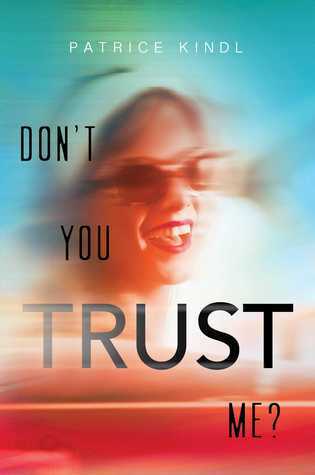 We're delighted to have Patrice Kindl stop by to chat about her latest novel DON'T YOU TRUST ME? Patrice, what was your inspiration for writing DON'T YOU TRUST ME? I was working on a very different kind of book (a comic Regency romance) with a character I mentally referred to as, "the psychopathic governess." Although my mental reference was a bit flippant, it made me pay attention to studies and news articles about personality disorders. When I realized how common they were, that they occur in all levels and kinds of societies, as well as the fact that they tend to come to full flower before or during early adolescence, I felt as though I had to write about it. And of course, it had to be a comedy. I struggled with the decision about pushing two innocent girls down a flight of stairs and locking them in a basement. I could not decide how far I wanted the violence to go. One of the points I was trying to make with this book was that people without a moral sense are not necessarily mass murderers -- they are more often simply liars and thieves. It would have been easy to go overboard, or on the other hand to flinch away from anything physical (I don't even like squishing insects, personally). If you like unreliable narrators, you might like WE WERE LIARS, by E. Lockhart, the title of which is at least honest about being dishonest. How long did you work on DON'T YOU TRUST ME? I got the idea two years before I wrote "The End" on the manuscript. However, I was working on another book at the time I thought of it and my idea had to wait its turn. I think it took a little over a year to write. I am not a fast writer. It taught me that I am highly suggestible. I became absolutely obsessed with the character. Several times I could have sworn I saw her in the flesh. One time she nearly ran me over in her "borrowed" Corvette. On purpose, I might add. You'd think a fictional character would be grateful to her creator, but apparently not. What do you hope readers will take away from DON'T YOU TRUST ME? Not everyone out there is like you. Yes, the vast majority of people you will meet in your life are basically decent human beings. But there are those who do not care if, or how much, they hurt you. Be aware, and if a relationship begins to feel too one-sided, or if you suspect you are being consistently lied to, seriously consider ending it. I was first published in 1993 (OWL IN LOVE, Houghton Mifflin). Before that I had completed one book, a fantasy called "The Witches of Winter Hill." It was never published. I have written two books since then that did not get published, in addition to THE WOMAN IN THE WALL, Houghton Mifflin 1997; GOOSE CHASE, Houghton Mifflin 2001; LOST IN THE LABYRINTH, Houghton Mifflin 2002; KEEPING THE CASTLE and A SCHOOL FOR BRIDES, 2012 and 2015 respectively, Viking. Certainly. Here you go: "Hah!" At least, this is almost the same word as "aha," but different. Should you happen to find out that there is a key to writing a novel, please send me one. I haven't a clue. I work from home with my feet up and with at least one dog on my lap. The contortions required when both dogs and the computer require lap space are aging me before my time. I'm half crippled at the present moment (move your FOOT, dog!). Sometimes the parrot sings to me (catchy tunes like "Old MacDonald Had a Farm:" ... With a buck-buck here, and a buck-buck there ...), but usually no music. Well, the standard advice is: read a lot and write a lot. It's hard to better that, especially as (see above) I have no idea what I am doing. A sequel to DON'T YOU TRUST ME? entitled, FOOL ME TWICE, thus giving Morgan another shot at killing me off. Have you had a chance to read DON'T YOU TRUST ME? yet? Have you written a book with an unreliable narrator? Have you ever thought you saw your characters in real life? Share your thoughts about the interview in the comments!